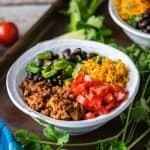 These Healthy Taco Bowls are paleo and Whole30 approved! They are made with a flavorful cauliflower rice, and a delicious combo of lean ground beef and ground turkey. Mix together all of the spices for the Taco Seasoning and set aside. Pour 1 Tablespoon of olive oil in a large skillet over medium high heat. Carefully place the ground beef and ground turkey into the hot skillet, and break apart into small pieces using a spatula or spoon. Cook for about 15 minutes, or until the taco meat is thoroughly browned. While the taco meat is browning, in a separate skillet add 1 Tablespoon of olive oil over medium high heat. Pour in the frozen cauliflower rice, turmeric, garlic powder, chili powder, 1/2 teaspoon salt, and 1/4 teaspoon pepper. Stir everything gradually as the cauliflower rice begins to thaw. Heat through for about 8 minutes, until the rice has completely thawed. When the rice is done, pour it into a bowl and set aside. Wipe out the skillet with a paper towel and add 1 Tablespoon of olive oil over medium high heat. Add the diced bell pepper and saute for 4 minutes. Toss in the black beans, 1/4 teaspoon salt and 1/4 teaspoon pepper, and turn off the heat. Now back to the meat! Add the Taco Seasoning into the large skillet of browned taco meat. Toss everything around until the spices cover most of the meat. Add 1/2 cup of water to the skillet, and cook everything for another 2-3 minutes stirring occasionally. Turn off the heat and assemble your bowls with any garnishes you like!